The third album from Chicago doom merchants Trouble mis-fires and crashes into a heap by the side of the road. There are brief moments to savour on Run To The Light, but the overall effort is underwhelming, lacking in focus and too easily lost in vagaries. 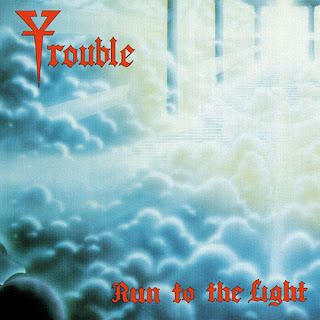 Trouble's signature sound is slow, down-tuned and full of power, the trouble (ahem) being that when the song structure is weak, the deliberate pace leaves nowhere to hide. Tracks like Peace Of Mind and Tuesday's Child are clearly underdeveloped, and unbecoming of a band onto its third album, Trouble resorting to throwing fragments of disjointed music together and hoping for the best, frequently leaving Eric Wagner's vocals horribly exposed. Only a couple of the selections on Run To The Light are worth comparing to the band's better output. Opener The Misery Shows floats in on spooky keyboards before landing on a sturdy riff made of solid metal, but in a sign of the weakness that pervades the entire album, the band do little with this foundation, the track meandering in the clouds until bumping almost accidentally back onto the hook that should have been holding the track together. On Borrowed Time is perhaps the most memorable track on the CD, boasting a doom-laden keyboards and guitar intro that climaxes with an impressively gloomy rendition of the opening notes from the undertaker's theme, but again, the rest of the song does little to develop the concept beyond the obvious. Run To The Light proved to be Trouble's last album for Metal Blade, the band going on a much-needed three year hiatus before re-emerging with Def American. Produced by Jim Faraci and Trouble. Engineered by Ian Burgess. Mastered by Eddy Schreyer.